This post was published by Zbigniew Maxurak and subsequently posted on ReaganGirl.com on May 15, 2012. Another libertarian Congressman, Justin Amash of Michigan, claims that although he supports a strong defense, “There is much room to cut defense spending.” No, Congressman, there isn’t, and if you REALLY supported a strong defense, you wouldn’t be supporting massive cuts to defense. You can’t have it both ways. Either you support it without any qualifiers or you don’t and you support the massive cuts that you endorse. “A minority of Republicans including California Representative John Campbell say the automatic cuts should be allowed to take effect without any changes, including the defense cuts many of his colleagues and the Pentagon say would be devastating. No, there isn’t a lot of waste in defense, and certainly not $100 bn per year. Not even close. There is some waste, and it should be eliminated (and remember, I’m the author of the largest DOD reform proposals package ever devised), but there isn’t nearly as much as $100 bn per year (which is what the sequester and First Tier BCA-mandated reductions would cut out)! The HASC has come to similar conclusions and also warns that most of the damage that would be done to defense would be irreversible. For example, if you cancel a shipbuilding program that a shipyard relies on, the shipyard will have to close and be liquidated and will not be there to reopen when you’re finally ready to start buying ships again. Moreover, first tier BCA-mandated budget cuts plus sequestration ($108.7 bn a year on average) plus zeroing out OCO spending (as a result of the inevitable US withdrawal from Afghanistan, $88.5 bn per year on average) means cutting the military budget by a total 32.11% – much deeper than the cuts made after the Vietnam War (26%) and almost as deep as the cuts that followed the Cold War (34%-35%). Now think about it, Dear Reader: we now know that the post-Vietnam and post-Cold-War defense cuts WRECKED the military. So how can we honest expect this round of defense cuts NOT to gut the military? We can’t. Simple math alone should tell you that, even if you don’t believe Obama’s own SECDEF, Deputy SECDEF, and Joint Chiefs of Staff, as well as many lower-ranking generals, retired military officers, and independent analysts. 3) That Panetta, Carter, and the Joint Chiefs are right about sequestration. I’ll leave it to you, Dear Readers, to judge for yourself which it is. Furthermore, not only would sequestration gut defense, it would be extremely unjust. The DOD would be punished for CONGRESS’ FAILURE to design a fiscally responsible federal budget; and even though its entire budget accounts for just 19% of federal spending, and the core defense budget (which would be the portion hit with the sequester’s cuts) accounts for less than 15%. Yet, this 15% portion of the federal budget would bear a full 50% of sequestration’s cuts. This would be deeply unjust and disproportionate, in addition to gutting the military. 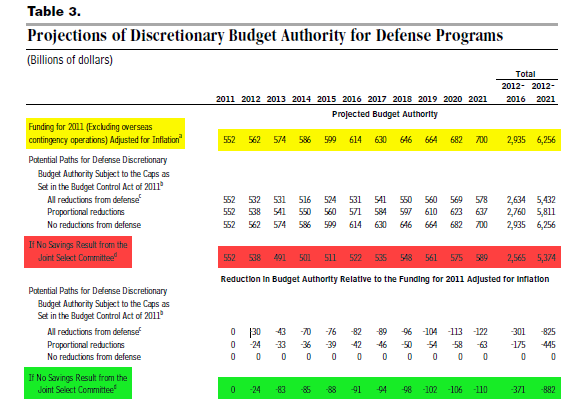 But half of these “guaranteed” discretionary spending cuts would gut defense and thus imperil the country, and gutting defense with such deep cuts because this would cut spending somewhat and is “guaranteed” to happen is deeply irresponsible and downright treasonous. Entitlement reform does not mean “savings that may or may occur”; it means real spending cuts, in the (by far) largest portion of the federal budget, 63% of the total, and as consequences, it means BIG spending cuts – far bigger savings than defense sequestration would ever produce. The Ryan Plan would enact real spending cuts in its first year and, over a decade, save taxpayers over 3 times more money through alternative cuts than the sequester would. To sum up, defense spending sequestration would completely gut the military and thus imperil the country; would be deeply unjust (punishing the DOD for Congressional failure); would be disproportionate; is not necessary to reduce the deficit or balance the budget; and would save much less money than conservative plans that don’t cut defense spending (such as the RSC’s and the Heritage Foundation’s plans) would save. Let me be clear: there is some waste in the defense budget, and I am not defending it; I support rooting it out. But there is far less of it than defense’s opponents claim, and certainly not as much as $100 bn per year. Moreover, any wasteful DOD programs need to be eliminated carefully in a targeted manner, specifically, one by one, and not used as excuses for deep, crippling defense budget cuts. And anyone who claims there is as much as $100 bn per year worth of waste in defense spending needs to be forced to say what exact programs he claims are waste, list them all, prove that they cost $100 bn per year, and say why he thinks they are “wasteful” and how would he defend the Nation without them. The burden of proof is on the claimant. And, as Ronald Reagan said, anyone who proposes to cut defense spending must be forced to say which defense programs the Nation can do without, why, and how it would protect itself without them. In short, the Congress MUST protect defense from sequestration by stopping it completely.